Anne, of Aristata Land Arts, was looking for a crazy person who could pull off a crazy idea: weld, hoist, and support huge round pieces of steel. Woof. Why do they make steel so heavy?! 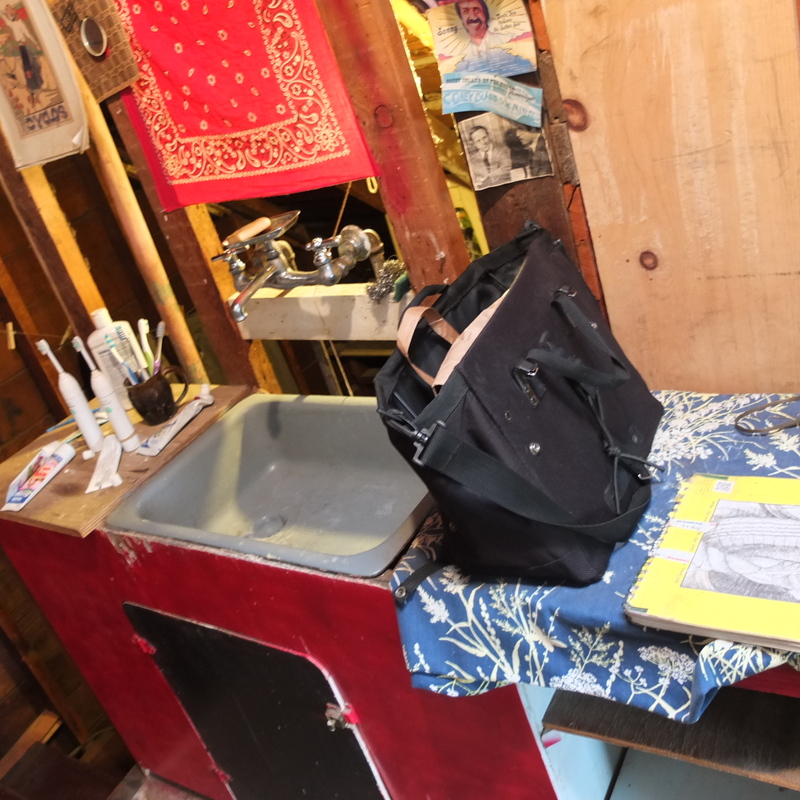 Corinna came to me with the true Portland dream, to live in an ADU(accessory dwelling unit) in the back yard. She had a problem though, no stairs. So I came up with this design. 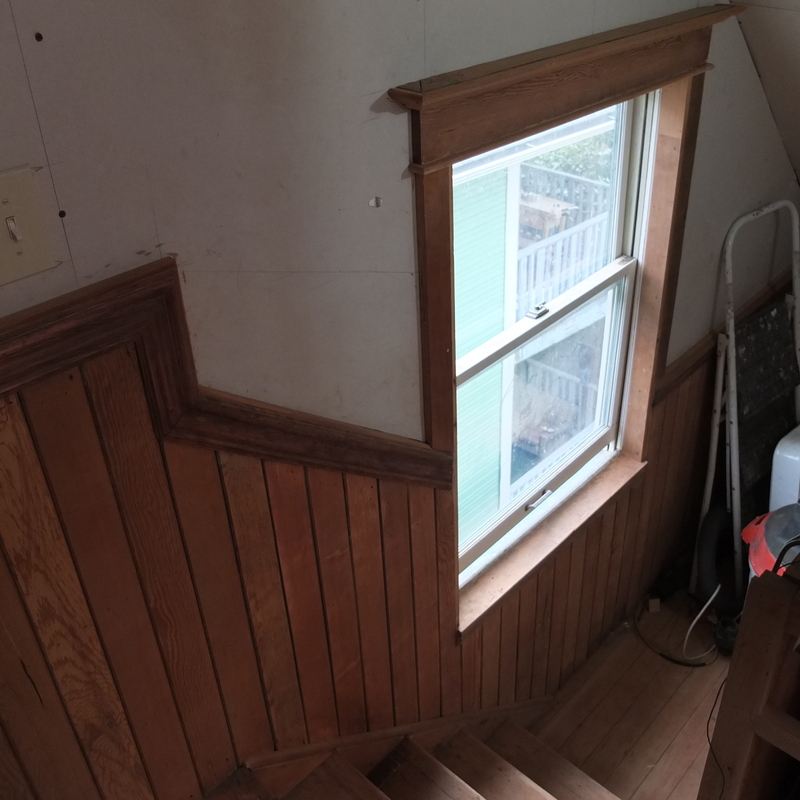 Normal stair treads sit on a bulky piece of wood called a stringer. In order to make way for the built-in shelving I inverted the beam, and hung the treads from, you guessed it, STEEL! I love the stuff. 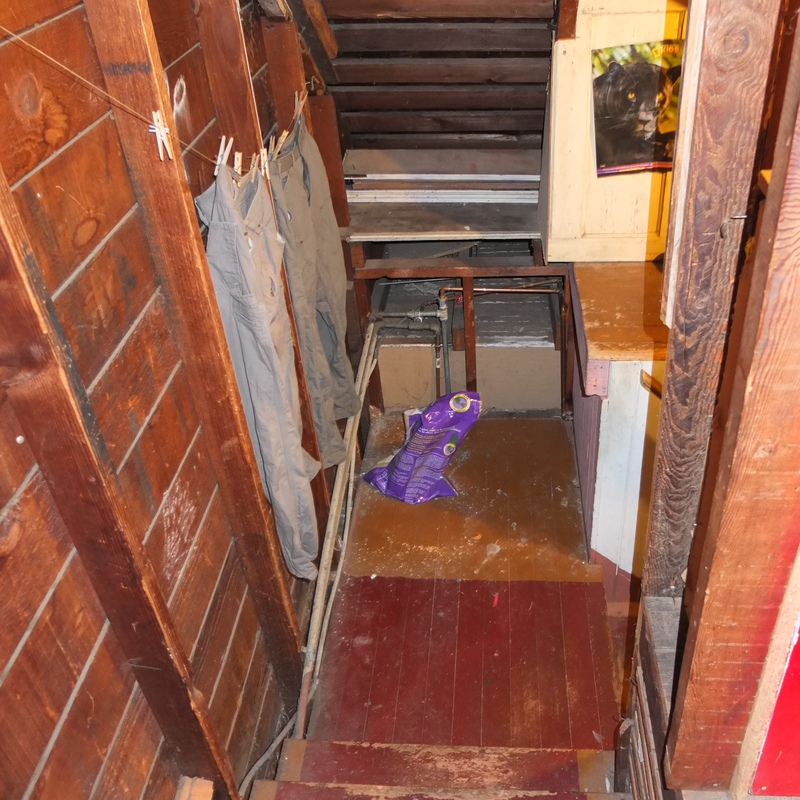 In addition to hell-a storage underneath, these stairs feature a bent steel banister and %100 reclaimed old growth CVG(clear vertical grain) lumber. These bike hangers sport a mid-evil look. Hang and lock your bike…or lock some one up in the dungeon. ‘what does it all mean?’ I don’t know Jeremy. I wish I did. Details 2″ poly glass. Bullet proof! Next, she asked me to move even more steel and this time stick it in the dirt and build some stairs with it. Plate steel is no joke. this retaining wall references gabions, or square baskets filled with rocks used in the arid regions of Eastern Oregon to build fences off of. This region holds a special place in Anne, and when the wet comes at least she’ll keep a dry heart. People’s has been one of my steady Eddies. Who says that steel and veggies don’t mix. Thanks for the regular business People’s Co-op. agnets for posting. Notice the forged steel frills and lettering. The back area was shy of covering the employee’s bikes, but alas, The Co-op had used all of its permitted permanent roof space. So I built this awning extension that can be flipped up in less then a minuet, thus fulling the city’s requirements. As the numbers swell during their farmer’s market they needed more temporary bike parking. People’s had me build a number of these bike racks which fold up for easy storage and locks together for security. People’s compressors were driving the neibors nuts so we devised this system of industrial noise curtains to curtail the nuisance. Diminutive shopping carts require a sweet little place to shove them and keep them dry. 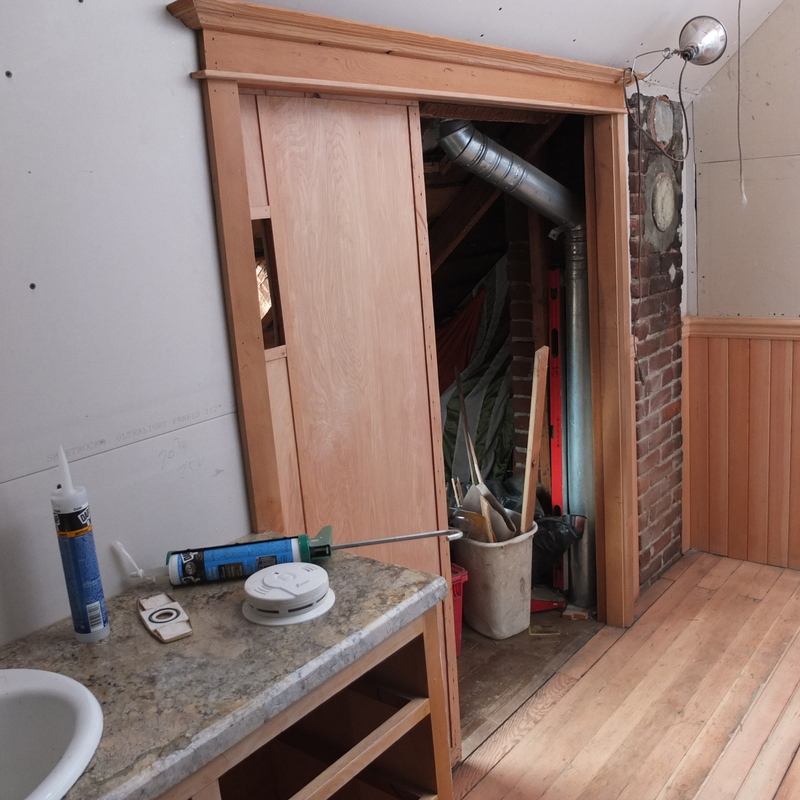 This North-Portland home benefited from an attic redo featuring new windows, sky light, custom pocket door, rebuilt/reclaimed cabinets with stone top and retro sink, and hey… that’s some fancy wood work! More then 3/4 of the materials that went into this project have been reclaimed! Ben you really pulled out the stops and unleashed me on this one. Thanks! Ruth came to me with space problems; not enough square footage but too much head room, over 12 feet up! You gotta hand it to those old Victorian homes, but her room felt a little like a coffin hole. My solution was to build a bed loft with built in desk. 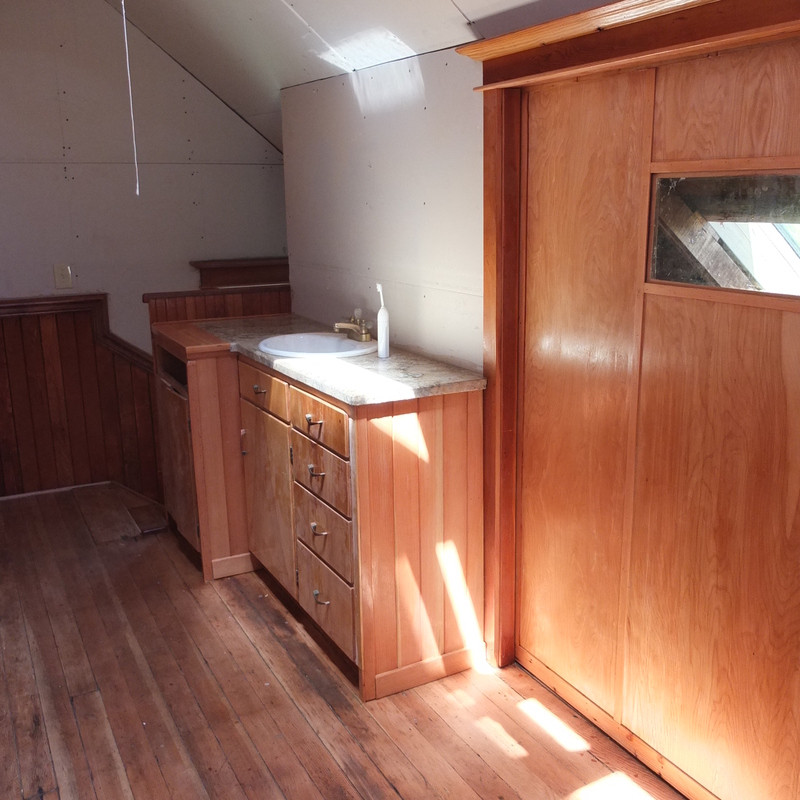 This project was made from %100 reclaimed wood from and old reconstructed church roof. Its amazing what milling can do. Sorry to say I didn’t get good pics. This one turned out quite beautiful! Lacking a closet, I built this ‘closette’. It has a custom miniskirt rack. In collaboration with Emile from Golden Ration Construction, we built this charming addition on an upper tabor house. It expands the liveability and show cases the back yard bamboo garden (that we also planted years earlier). 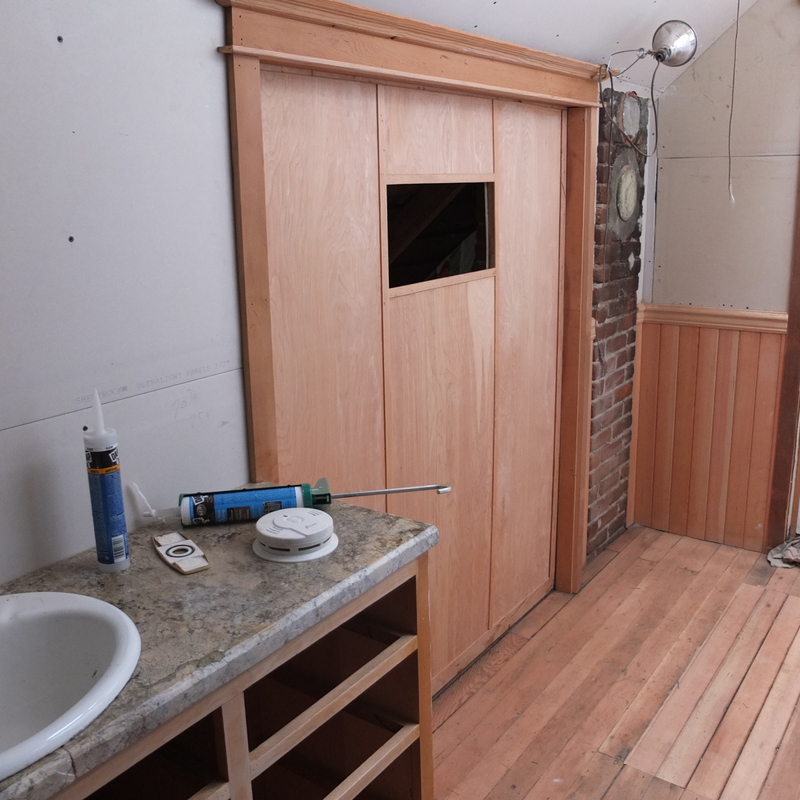 It features a French pocked door, submarine style sky light, reclaimed finish material, and natural plaster. Kick back, see it before it hits the theatres! What’s an Artistic director to do with-out a screening room? Well here you go Mike. In 2008 I equipped this dreary basement with walls, ceiling and great guts. It features lighting, killer built in sound system, and hide-away screen. Thanks and good luck with the next film! River Rock Nursery, entrance and gazebo.